Let me just say that motorbikes were never my thing. Until I came to Ubud. By now, I have traveled around behind different drivers. I have put my arms around gorgeous washboard abs, potbellies, and fleshy female middles. I have traveled in cloudy weather, in sunshine and at night in pouring rain. I never imagined it could stir my juices to be on a motorbike! But when we traveled to see Ketut Liyer’s son, we went on foot. I could have chosen to get on a motorbike, to get there faster, but there is something about walking to him; the curious journey that gets you there. Dita came along for the fun of it. We spent half the day stopping at cafes and restaurants, trying out the lovely offerings of Bali; banana lassi, tom-yum soup, sweet coconut juice straight from coconuts as big as bowling balls. The most beautiful Tom-Yum soup I've ever seen. They should make coconut juice the new water. Witches who kidnap children to steal their youth should be given a chill pill and a big coconut to drink because that's youth right there in the hull. We shopped around and stopped to ask for directions to Ketut's place as we went along. Then we meandered some more, haggling here, nodding politely there and almost buying things we would later regret. Late into the afternoon,we were close to the Liyer house. Ketut’s son Putu is now taking up his father’s tradition and practice. I was excited to meet him. A part of me was worried, however, that we would not find the house. What if he was not at home? That would be just my luck. The road took us into a rural neighborhood where the asphalt merged with the dirt. The chickens and roosters were kings and queens, here. So many houses with tiny elaborate doorways jumbled up together between the palms. The facades were faded and more ramshackle than they were in central Ubud. I tuned into the quiet purr that my curiosity makes when I’m just about to find out something. Finally, Dita found it. We entered gingerly through the doorway. It felt odd to just be able to enter the house of someone so revered in the village without so much as a knock, let alone a ring. But then, you could enter all the houses in Bali because almost all of them, kept their front doors open. The medicine man was sitting on the steps of one of the raised platforms, chatting with his family. I asked if I could speak to him. His matriarch (I’m not sure if it was his mother or his wife) told me to pay then signaled for a small woman to take care of the sacred business of putting me into a sarong. You cannot speak to the medicine man in cotton pants! A moment later, I walked up to the platform where Putu was waiting for me. He gestured for me to sit on the wicker mat, opposite him. Now, I could write in exact wording what he said to me and what I said to him but I would like to point out what seeing Putu meant to me. This man, as soon as I began to talk to him, had a lemony-sweet energy, like a frangipani flower. I never experienced this energy with another human being. He emitted such pure and childlike joy that must have bloomed a multitude of times in his life that he has probably forgotten what suffering feels like by now. I was in such gratitude to be in this presence that I bloomed myself, starting from the heart and out to my limbs. Putu seemed rounder and stockier than his father, less intimidating (at least from the pictures). His face shone, especially when the apples of his cheeks were pulled up in a wide grin. So many glistening teeth! The smile almost made his eyes disappear behind his spectacles. I put my palms together and said “I’m very happy to see you!" “I’m happy to see you too!” he responded and the grin got even wider. As he spoke to me, I became more and more present with him until, for a few seconds, I experienced the merger of myself with my surroundings, with him, with his grin and all the lines became sharper, like the cut of a mold. It was both frightening and exhilarating, like a spontaneous brush with nirvana. “No more sad!” I repeated. Don’t I? He proceeded to tell me about how Elizabeth Gilbert used to come to his father with her troubles. He spoke about her like she was a distant relative we both knew and cared about. And maybe she was. He ended the story with a laugh that shook him backward. The best synopsis of Eat, Pray, Love I ever heard. I wondered, however, if Ketut’s family used the success of the book to boost their business. It could be that. Or it could be that Putu was truly proud of Liz for her inspirational journey which has touched millions of lives. Or it could be a synchronous instance of chance that he mentioned her just then as I'm very much enamored with her story. I never even mentioned this blog to him. That took me by surprise and filled me with the serenity of assurance. Then, I told him I was heartbroken. He opened my palms to read them. I remember what he found in my palm. I remember clearly what he said to me. He explained to me what every line means and what my own unique imprint foretold. But as he read my fortune, and most of it was wonderful, I was already dismissing it as we went along. I retracted internally a little bit because I did not want to be told how many husbands I would have or how many children. Least of all when I would die. Something hit home for me, however. He found a second life line next to the primary one. He traced it, a small forking almost imperceptible line. I never mentioned how I felt about my home country, either. Yes, move to Bali. Can I admit here that I’ve thought about it? This fruity chunk of paradise that fell from the heavens. I have not seen suffering on the faces of the Balinese. Even the beggars on the sidewalk keep their palms open, asking for kindness, but with a smile and unshakable serenity. And I have heard the most heartfelt “good mornings” here. Not offered out of politeness or social decorum, but from a genuine place that cares whether or not you have a good day, or whether you arrive back safely at the end, or whether you have a nourishing meal, or if someone will have kissed your heart today. Well Putu certainly kissed mine. I thanked him with my palms together and got up. On our way out of Ketut's Place, Dita seemed a little aloof. A protective stop sign came up within me. Here again, an experience being discounted, yanked back into the world of reason and skepticism. I grew up in this world and I knew how it goes. I was so used to having my experiences discounted by the “adults”. This world has done its job on me perfectly well. I am a tenacious skeptic myself but I am in recovery. “I’d rather let it sink in before I talk about It.” I said to her. Dita had certain convictions about palmistry. I heard about them all the way back. I had my own too but I was not ready to share. Later, as we had tea and coffee, she mentioned her angel numbers, a mode of communication with the Divine that she believed in. My meeting with Putu was not only words, or assurances, or even magical fortune telling. It was an exchange of energy. Yes, the words pleased me. They pleased me so much that I forgot about my heartbreak and haven’t thought about it or felt it since. I have even reconciled myself with how my consciousness feels in the aftermath of the relationship that I lost. I’ve felt and accepted the elevation that it brought me. Some great hand in the sky had forced the banana peel off me to reveal the rambutan within. But I thought about my coversation with Dita for a while afterwards. I wanted to fairly and in a heart-centered way detect what it was that bothered me exactly. I knew exactly what I was taking in my heart from my encounter with Putu. I knew exactly what I left behind. If I was so sure about my own discernment then why did it bother me so much? The answer came from Miriam. Miriam is a wonderful witchy woman I met here. She is from Ireland. We became friends over fried fish and steamed rice. Miriam has had many struggles in her life and has come to Bali to heal. We talked about our journeys and about Ireland and fairies and leprechauns. We talked about demons. 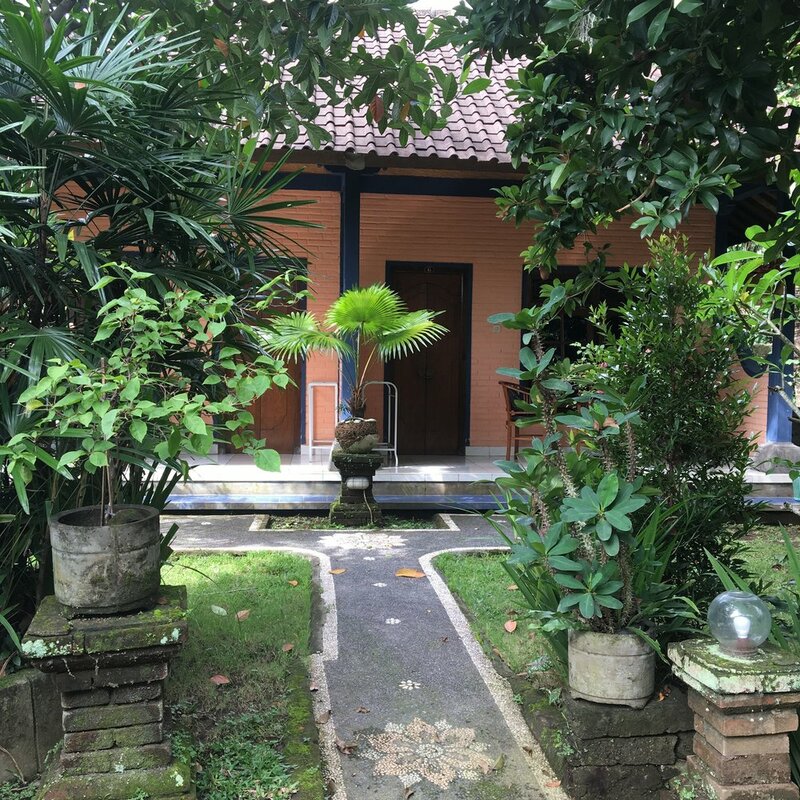 We talked about how the Balinese lack the understanding of privacy; her landlord was in the habit of entering her rented home without permission. This was due, of course, to the Balinese culture of keeping all doors open day and night. It is said to allow the Gods free entry. Miriam and I segued into discussing our personal truths and the boundaries we need to lovingly set up around them, even if it is to keep our loved ones from crossing over. Yes. It’s that feeling of being patronized and infantilized. I reflected internally that that was what I received from Dita whether she intended it or not - the influence of my own mother and father and a host of teachers in school, possibly my aunt too. Miriam and I recounted the instances in both our lives when our experiences or truths were discredited by the people in our lives, our families, our cultures, our schools. I’m finding it appropriate to share with you Miriam’s very charming and very Irish point of view. “A pig in shite.” She said with a thick Irish accent. I was a little confused. She proceeded to explain with her almond blue eyes brightening. So there you have it, ladies and gentlemen, probably the funniest thing I’ve heard in a long time. So be happy with your pig in shite. In fact, roll in the shite yourself. The first words that came to mind when the plane landed are Kekap Manis. And I giggled. It was dark outside like the Kekap Manis bottle. We were introduced to it through our Indonesian nannies when we were children. In Arabic, we called it “black ketchup”. It’s not ketchup, of course, more of a strong sticky soy syrup that made food shades more interesting. I was worried that Indonesia would smell like one of my nannies’ strange chilis mixtures; they smelled like fish guts turned inside out cooked with garlic and sewage water. It would waft around the house but no one would say anything because it would be rude stop the woman from making her native food. The first thing I do when I arrive, is keep my nose sharp for the aroma. Every country, or part of the Earth has its own aroma. I remember noticing it the first time in England when I visited in 2007 with my mother. The summer countryside smelled so ripe and warm and sweet that it was on the verge of spoiling. In 2008, Japan smelled like Sakura. It was in the sheets, in the soaps, in the food and even on the Japanese themselves. As for Bali - bracing my myself for the possibility of something nasty - it took me twenty four hours after arrival to try to describe the way it smells. In fact, my nose has been introduced to so many new aromas since I arrived here that I don’t, as of now, have the vocabulary to put it accurately together. I can safely say, though, that Bali smells like a mixture of smoky coffee beans, jackfruit, and wet laundry hanging out to dry in the sun. I’m staying in a room at a guesthouse in Ubud. The guesthouse business is rife here that I wonder if it is ever threatened by chain hotels or even by AirBnb. This guesthouse is owned by a man called Wayan and his son. It’s a lovely meandering place, four little “huts” within the walls of one house with a temple in the middle and gardens sprawling lush in between. Everyone I have met so far has been startlingly kind. It’s the land, I think. On my drive from Denpasar to Ubud, I witnessed the infinite abundance here. There’s so much of everything and nothing is being extorted. There’s so much grass, so many trees, shingles, motorbikes textiles, pebbles. The Earth just gives and gives and then gives some more without depleting itself. A land that gives, breeds gentleness and you could see it on Balinese faces - well most of them anyway. The greens painted thickly with a palette knife in the rice fields from a never-ending tub of pigment. Confused blue and white sky.The roads travel through impasses in the jungle where the trees fight through carved stone walls to let their hair tumble above you in golden strings. Lime green butterflies. Herons dipping their feet in the muddy rice paddies. Dragonflies as large as jumbo prawns. Banana trees; wise old crones with bloody flowers bigger than your head. I smelled a cinnamon leaf for the first time in my life. If you break it apart and sniff the moisture you’ll find real cinnamon trapped inside only your nose will find it greener than the stick. Everything was a wonder and a marvel. Yesterday I was in harsh concrete Dubai. And now, I’m walking in a coffee and spice plantation sampling the real riches of the Earth. Samples of teas and coffees made with the spices grown in the plantation. They bring you a tray that looks like an alchemist's ingredients and you sample shots of ginger tea, turmeric tea, lemongrass tea, Balinese vanilla coffee, ginger coffee, Balinese mocha and other curiosities. Wayan settled me in, very kindly and practically. He’s a short rectangular man with a face that wants to please but ends up looking confused instead. You could see him jumping from thought to thought only to arrive at the first again. There's is absolutely nothing about him contrived or unreal, from his patterned Balinese shirt to his flip-flops. I had a small stroke of inspiration. “Do you know Ketut Liyer?” I asked him. “Oh no! He dead!” he answered. I was comforted by his answer. Ketut Liyer was a well-known medicine man here in Ubud. He was also, the man who inspired Elizabeth Gilbert to come to Bali and, possibly, the reason behind Eat Pray Love. I already knew Ketut Liyer was dead. He died in the past year, as per Liz Gilbert’s facebook page. The reason I asked was because I wanted to witness how well the Balinese people knew each other. And, also, I was reaching for the confirmation that those people were not just characters in a book. “Well I want to see a medicine man. Best after Ketut Liyer,” I told him. “Hisan? What is that? An Arabic name?” Maybe this medicine man is Muslim. Ketut Liyer’s son is now the best medicine man in Ubud. Why do I want to see a medicine man? At first, I rationalized it as practically experimenting with holistic and traditional methods of healing in Asia. Yeah, my brain liked that. Nice and tidy and perfectly justified. We’ll start making a billboard…we could even throw in “looking for a cure for diabetes” somewhere in the tagline. But once my mind went to bed, I knew I was searching for something more meaningful. Not the medicine man or his practice. Not the healer and his apothecary. I think I’m searching for signs. Clues. Communications. In the meantime, I was hungry. I was curious to know if I would like Balinese food as well I liked the Indonesian food we cooked at home. My great grandfather brought pilgrims from Indonesia to Mekkah for a living. Indonesian culture did not come into our family just from our nannies but from a legacy of voyages back and forth from the dessert to the tropics. I grew up eating and loving Indonesian food. It has never been foreign to me. My grandmother is a top chef in Javanese cuisine. My aunt - and her Indonesian helper - come next. But having it from the source must be an entirely different thing. I went for the most popular dish: Nasi Goreng with Chicken Satay. Not very adventurous but delectable to the last bite. Afterwards, I went to see my friend Dita, my goddess friend Dita. She’s a cottony fiery luscious thing from Latvia that you can’t consume in large gulps because there’s not much of her. You could gobble her up too fast if you’re not careful. With Dita, you must learn to savor. Dita and I met in London back in March after I had completed the Hoffman Process. We were seated next to each other in a restaurant after being introduced by a friend. We spent the day walking and talking afterwards, as some well-fated friendships start. In a holistic Balinese hotel, Dita had arranged a “secret” goddess dance workshop for ladies, where she taught us bellydancing and celebrating our sexuality. It was a sublime experience but I left still a little deflated, not because the workshop was lacking- in moments it was ecstatic - but because, in the background, I was longing for a time past when I used to dream about sharing a trip like this with some people who are no longer in my life. There was also that ennui and sense of abandonment, being all alone on a tropical island with barely someone I know. I walked around Ubud at night feeling a heaviness settling inside me. The heartbreak that I was nursing in Dubai came back to be my shadow, tugging at my sleeves, my face, my eyelids. I didn’t know if I had the energy to nurse it some more. What was is it I was searching for and why wasn’t it happening already? I heard you calling, Bali, from miles away, months ago, like a large juicy mango-something had risen inside me and sung in an operatic note: Go to Bali! And then this large mango-something breathed like a living being, and made sweet juices in my belly to make sure I arrived. It’s only the first day, I argued impatiently with my impatience. Aum Bhoor Bhuwah Swaha, Tat Savitur Varenyam. Bhargo devasaya dheemahi dhiyo yo naha prachodayat…. (See Cyprus Journal). It was an invitation. I knew it was. Yes. I’m here. I accept. I stood in reverence, in fleeting love. Back at my little spot at the guesthouse, I sat down in my garden in the dark to meditate. Rain fell; gentle little licks, first here, then there. It would have been a deep dewy meditation had it not been for the mosquitoes! I went to bed wondering if I was really going to find Ketut Liyer’s son.